Beyond looks, the thing that potential clients will care about most will be performance data: how much more will this car offer than the existing model’s 641bhp, 0-100km/h time of 3.0 seconds and top speed of 207mph (333km/h). No matter what the McLaren’s vital statistics, it will have to look incredible if it wants to upstage Pagani. 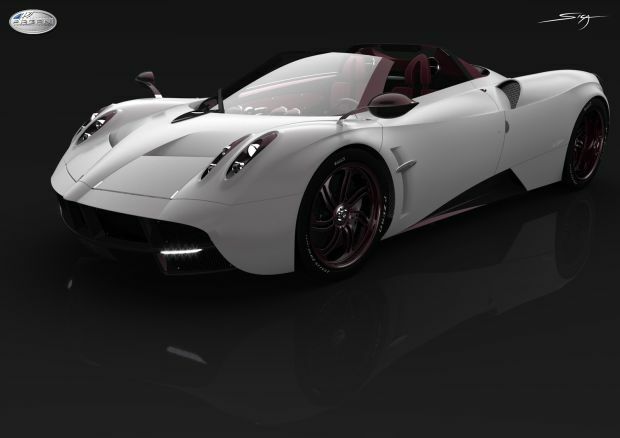 It’s bringing the open top version of the Huayra to this year’s show and over recent weeks has been releasing tiny teaser images of individual details in the run up to the full reveal. However, unlike the McLaren, we already know exactly what the Huayra will be using for propulsion — a bi-turbo 6-liter V12 engine that will send 730hp to the rear wheels. And while it will also share many of the coupé’s proportions, company founder and designer Horacio Pagani promises the car, which he claims is the most complicated project he’s ever undertaken, will have its own visual language: “As we moved forward with the Roadster, we decided to give her a bit more of an edge in order to create a slightly more aggressive shape than the Huayra Coupé.” So, as always with Pagani, expect a show-stopper. Compared with new automotive upstart Eadon Green, both McLaren and Pagani are veritable chatterboxes revealing entirely too much information. This Shoreditch, East London-based company has literally come from nowhere to be at this year’s event with something it’s calling the Black Cuillin. The 87th International Geneva Motor Show opens its doors to the public on March 9 but press reveals will get underway from March 7.